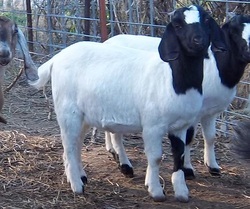 75% Boer - Sells with ABGA application. JAR54 DYNO DARK or "Joey" as we call her. Icy's buckling. This is a bottle buckling for sale in southeast KS. He is approx 78 % Boer and 22 % Kiko. He got colostrum and is well started on a bottle. One of triplets. 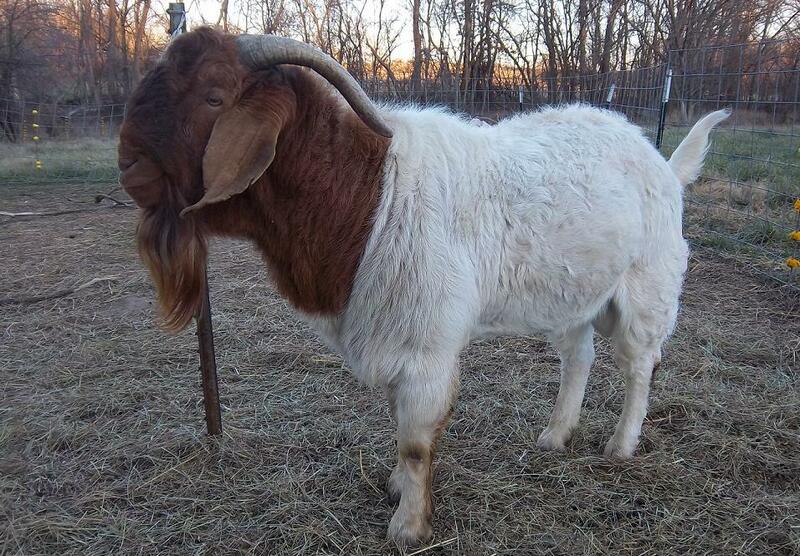 Sire was our big Fullblood traditional colored Boer buck "Blade." 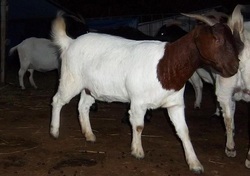 and dam a large Boer Kiko cross, no papers. SOLD - Thank you Shelby. We have used our Fullblood Boer buck Blade for two seasons and kept daughters of his for replacement does so we are now offering him for sale. His bloodlines include EGGS and Ash Creek breeding, including RRD GAUGE P529 **ENNOBLED** and EGGS EGGSTENDED FORECAST **ENNOBLED**. 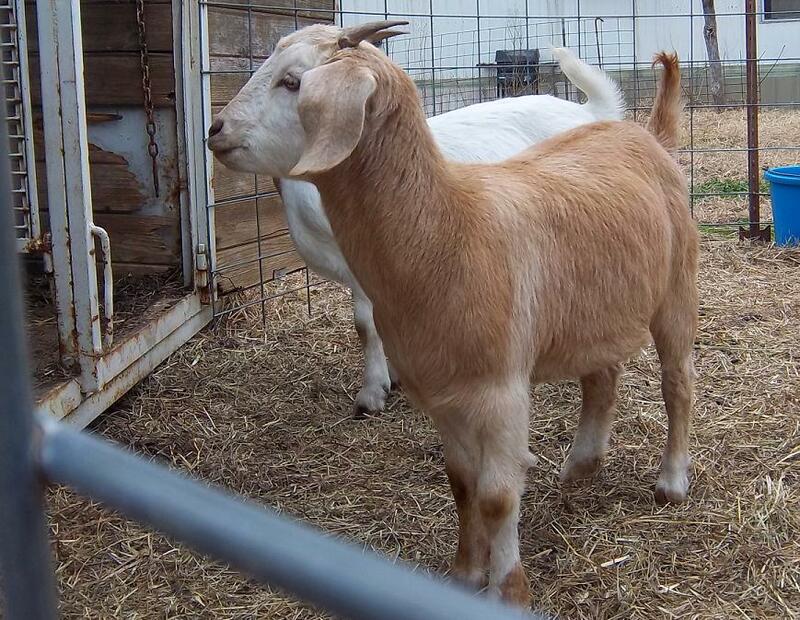 See his pedigree and more pictures on the "Bucks" page. SOLD. 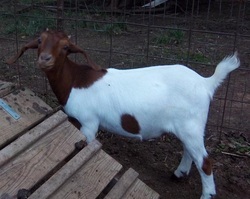 "Red Spot" is a dappled 98.5% Purebred Boer buck. He will sell with his ABGA application so you can register him. DOB 4-1-2012. He has a good bite and clean 1x1 teats. He has been vaccinated, had his hooves trimmed and is ready to go. If you want to add color to your herd he will do it. 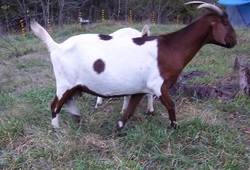 His sire is a red spotted Boer and his dam is black. Could produce black or red dappled kids if bred to the right does. 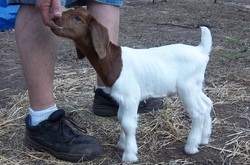 SOLD - Thank you Karen L.
"Japan's dappled doe" is an 88% Boer doeling born this spring. DOB 3-25-2012 She is one of twins. Sire is a fullblood red spotted Boer buck and her dam is a nice, clean teated red doe with both red and black Boers in her pedigree. She will sell with her ABGA application. SOLD - Thank you Steve G. & Family. "Dot" is a nice doe who loves face scratches. She is the full sister to the doe "Nifty" above. Excellent mother, tends to throw paint kids that have similar markings to her. 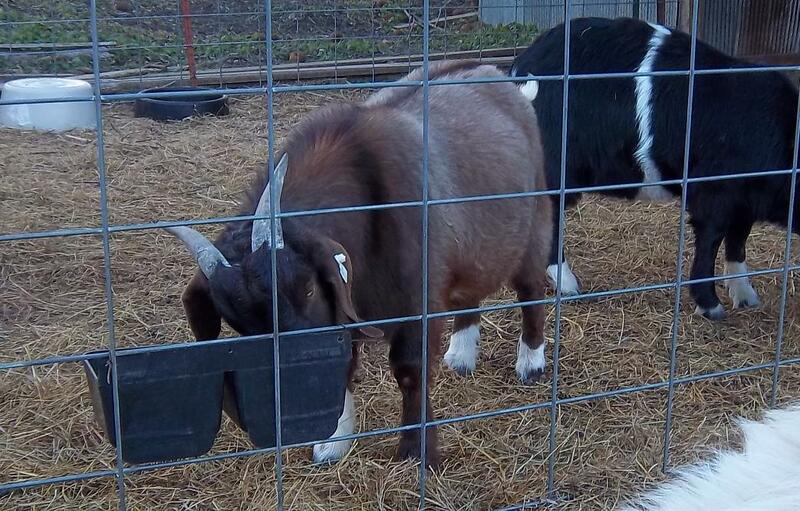 See the "kids" page to see a picture of her paint doeling from this spring. Another good doe I hate to sell but I am keeping her daughters and not everyone can stay! SOLD Thank you Sarah & Jared. "Nifty" is a good, honest doe who has been on our farm since birth. She is an excellent mother to her kids. She has only had a single once (her first kidding), all others have been twins or triplets. Good bite and clean teated. Her sire was a mostly red paint and she is versatile in that she tends to throw colored kids if bred to color and traditional if bred to that. Really nice doe I would not be selling if we were not reducing our herd. SOLD Thank you Sarah & Jared! "Bandit" is a smart doe and an easy keeper that has a good amount of colored Boers in her background. She had twin bucks this spring. One red and one a red dapple so she does produce spots and color when bred to the right buck. She was an excellent mother to them. SOLD Thank you Sarah & Jared. 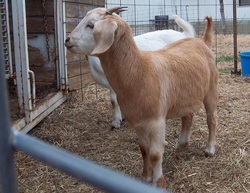 "Clyde" is a 98.5% Purebred Boer buck. He will also sell with his ABGA application so you can register him. Born on 4-1-2012 and old enough to breed does now. He has been vaccinated and had his hooves trimmed. Has a good bite and full pigment. 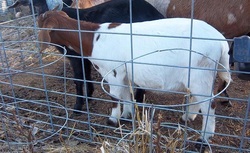 His sire is our red spotted Boer buck "Frost" and his dam is a black purebred doe. His full brother was a red dapple. 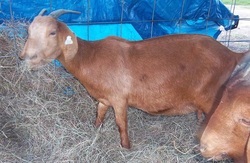 This is a nice, red buck with lots of color, dapples and good goats in his pedigree. SOLD -Thank you Jayme. 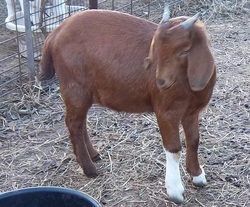 "Zoey" is a spotted Nubian / Boer cross doe. Has been with our FB spotted Boer buck "Frost", could be exposed. 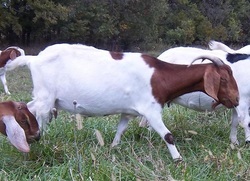 Her sire was a big, loudly dappled Nubian buck and her dam is a solid red Boer (whose sire was a black Boer buck). No papers but lots of color behind this goat. 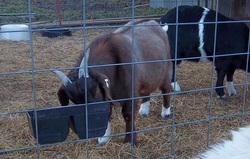 Zoey also comes from a long line of clean 2 teated goats and she is as well. SOLD - Thank you Karen and Lowell. "Japan's blonde doe" DOB 3-25-2012, one of twins. 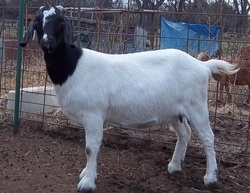 She is an 88% Boer doe that will sell with her ABGA application so you can register her. 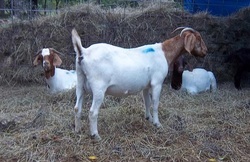 The sire to this doeling is our spotted buck "Frost" and her dam is a nice red 75% doe and her birth sister was dappled. She has a good bite and clean 1X1 teats. (her dam, sire and sister all also have clean 1x1 teats and good bites. ) SOLD - Thank you Karen and Lowell. 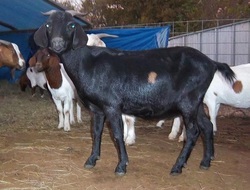 "Black Head Commercial Doe" No papers but this commercial Boer doe has always had twins and is a good mother. 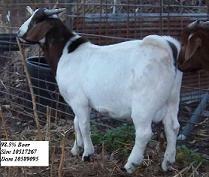 She has been exposed to our Fullblood spotted Boer buck "Frost" since December and we are selling her as "exposed". If she is bred she should be due sometime in May. Only selling because we are reducing our herd and want to focus more on Fullblood breeding stock. SOLD - Thank you Vincent W.
"Belle" is registered as a 50% Boer but in reality she is actually 75% Boer but her Boer cross dam was not registered. She does have 50% ABGA papers. She has always had twins, been a good mother. A hardy doe that was born on our farm and has never had any health problems. SOLD -Thank you Jayson W.